Essendon fans were singing from the roof tops when the Bombers announced the return of two of their favourite sons. James Hird & Mark “Bomber” Thompson together took the weight of fans expectations into the 2011 Season. The Bombers got off to a flying start with a big win against 2010 Preliminary finalist the Western Bulldogs. Things were looking bright and Talk Back stations around the state were full of Bombers fans wanting to praise their side. After a close loss to the Sydney Swans in round 2, the Bombers then put St Kilda to the sword with a 52 point win. A draw with rivals Carlton and a 30 point loss on ANZAC day to the Magpies, and the Bombers fans still had high hopes for success in 2011. A home game followed against the Suns and the Bombers managed 15 first quarter goals and won by 131 points. Kyle Reimers booted 8 goals bursting onto the scene as the next big thing for the Bombers. In the next fortnight Essendon had wins over West Coast and Brisbane to cement them in the Top 8. 2011 “Dreamtime at the ‘G” turned into more of a nightmare for the Bombers though, with the 21 point loss starting a string of 5 games where Essendon failed to register a win. Melbourne and North Melbourne, both below the Bombers on the ladder, managed wins by 40 and 21 points respectively while the Bombers couldn’t get over Fremantle at Subiaco or Hawthorn at the MCG. Hird was suddenly in the firing line as the Bombers quickly slid down the ladder finding themselves on the edge of the Top 8. With 13 individual goal kickers though, Essendon came to play last week and finally got a win up against the top of the table Cats, hanging on in the dying seconds to record a 4 point win. Going Forward: It’s been a Roller Coaster ride for Bombers fans in 2011 and it’s set to continue that way for a few years. Essendon have a young line up, thought to have been primed for a push at the Top 4, however the young side has struggled to close out sides late in games. In 2011 Essendon will set up an away Elimination Final against Sydney, which they have a chance of winning, any further than that we will see. A young side with potential, give the Bombers a couple of years and expect them to be regular attendants to September action. Their young brigade have shown talent beyond expectation, in particular Dyson Heppell, who as a first year player has announced himself with standout performances aplenty shortening with the bookies as favourite for the NAB rising star award. If the Bombers can pick up a true key Half Forward along with a couple of running Backmen who can play a Quarterback type role, they would be set for the years to come. With GWS offering up quality young players the Bombers possibly need to look at dishing off Hille, Ryder or Bellchambers in order to pick up some younger talent while these players still have value within the Market. 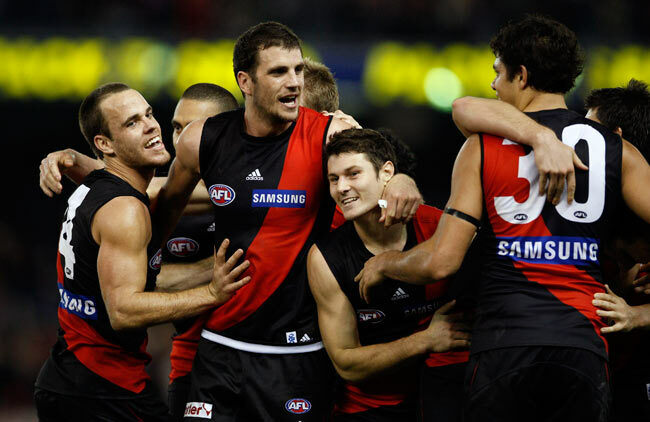 Tall timber is not hard to come by in the Essendon line up, something that GWS coach Kevin Sheedy will be searching for come their inception in 2012, so expect the Giants to go after Tom Bellchambers with Hille and Ryder more or less hands off as Bombers. A need for caution as the Bombers continue to soar. Glory and fame returns to Windy Hill.